MarketMeSuite is an online software program that allows you to schedule social media posts on Twitter, Facebook (personal, business pages and groups), LinkedIn and more. 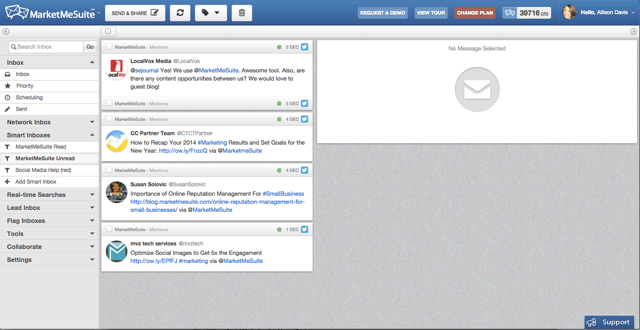 According to their website, MarketMeSuite is “The Smarter Way to Manage Your Social Media” and I believe it’s true. I’ve used several scheduling tools and the one I find to be them most successful and user friendly (plus more bang for your buck) is this one. When you log in to the website, you are shown your most recent news feed from your social media channels. Not only can you link your social media channels mentioned above, but they have an active community support section which keeps you “in the know” of the upcoming changes that will occur such as adding in Google Plus, an iPad app, WordPress connection and more. As a customer, you have the opportunity to post to the wall or send in a personal email. It’s really an interactive site allowing each “voice” to be heard. There are several features about this program that are stand alone great. They include the connection to your Constant Contact account, Team Collaboration and the Geo Targeting feature. 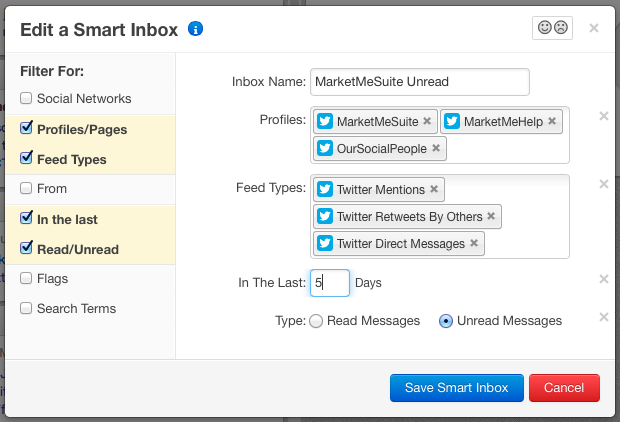 If you have a Constant Contact account and create newsletters, events, promotions, coupons, social media campaigns and more, you can tie it in to your MarketMeSuite and schedule them all on your social media channels. Streamlining your work and making it a “one-stop” social media platform. The Geo Targeting assists you in content creation. For example, when scheduling a post, you might want to focus on local fashion. You click on the geo targeting button and type in local fashion and it’ll pull up local content via google and other sites. That way, you never run out of things to post. You can share articles, connect with others and more. Another feature I adore is the Smart Inbox. You can edit what posts or social media accounts to view when you first open up our account. This is customizable and allows numerous options. An email is also sent to you with your activity summary daily. 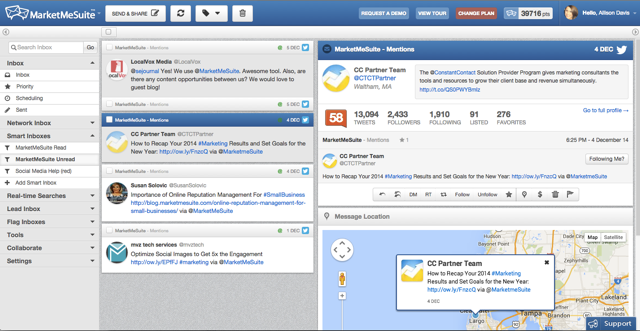 You can also see all of your mentions on the different social media channels and see your analytics as well. Here below is a December 4 mentioned of MarketMeSuite. The Community Manager was gracious enough to send over a few photos for this post. Great news: MarketMeSuite has graciously offered a 3 month membership to one of my lucky blog followers. To enter, just comment below regarding which feature you think impresses you the most about the program. A winner will be chosen on Tuesday January 27th around noon. Whether you win or loose, a 14 day trial is available for you to try out. You can use my affiliate link here: MarketMeSuite-DSM services. I’m always looking for ways to help with my time management! Looking forward to trying it out. It’s a great product and let me know how it works out for you. Thanks for reading the article. That geo-tagging feature seems very useful when I’m looking for things to share. Thanks for sharing this. That’s one of my favorite features as well. It helps you find content to post when you are stuck. Thanks for your comment Cris!!! I love the idea of streamlining the social media processes. I know, it makes it so much easier to get work done!! !